Conductive Graphene PLA Filament, a material by Graphene 3D Lab, is specifically designed to allow you to 3D print electrically conductive components using almost any commercially available desktop 3D printer! By purchasing this filament, you agree that you have read and agree to the product description below, including the handling and disclaimer statements. Download our PDF flyer by clicking here! Room temperature matters! Print in a cool dry room or your print might not come out clean. This filament is very plastic and is affected by ambient temperature. Conductive Graphene Filament was tested using a direct drive 3D printing extruder. We do not guarantee that Conductive Graphene Filament will be compatible with non-direct drive 3D printers, such as delta models. Avoid leaving filament in a heated nozzle for an extended period of time. Care after Printing: ALWAYS put your filament into a water proof air tight bag after using to limit contact with humidity. Dessicants can be very helpful. How do I prevent clogging when printing with Graphene PLA? What should I know about Temperature? The intrinsic properties of our material are such that we do not recommend keeping it in the nozzle when it's not being actively utilized. It will cause the thermal expansion of the filament resulting in the obstructed nozzle/ guiding tube. However at 220 °C and with a relatively high printing speed it should print just fine. We do print substantial objects with each spool before we sell it. It will not print at 180-190 °C as the melt viscosity isn't yet in range, so it will just expand and clog the nozzle. Printing at 250 °C will result in partial degradation along with substantial aggregation of nanomaterial yielding the clogged nozzle as well. Please, observe the printing temperature recommendation (220 °C) for this product. Also, please make sure that your printing bed is well leveled. If it's not well leveled, you will likely accumulate significant build up on the external surface of the nozzle, which when it solidifies, will obstruct the melt flow. Try to clean the external surface of the cooled nozzle with alcohol if that happens. Make sure to keep filament in the closed bag with desiccants when not in use. How to unclog nozzles when printing with Graphene PLA? The intrinsic properties of our conductive filament is such that it shall not be left idle (as not extruding-printing) in the heated printed nozzle. It may expand and cause blockage. After printing is finished it shall be unloaded promptly. Unfortunately, there is no easy at home way to clean the nozzle. We use harsh organic solvents to dissolve the material if needed. We have two other methods available as well. We advise to try and heat up the clogged nozzle to 200C (without filament present) and try to insert a small copper wire into the opening of the nozzle and push through the clog. You also can try to soak the unscrewed nozzle in alcohol and then try to clean it with the wire. The other way, try to flush it with a regular polymer, such as plain PLA or ABS. If nothing works you just may need to change the nozzle. The best way is to prevent blockage happen is not to leave filament sitting heated in the nozzle while printer is not actively printing. After the printing is complete, remove filament from the nozzle promptly and flush with a regular polymer filament. Please follow the storage guidelines to ensure the best quality of the material and use advised printing parameters to prevent material decomposition in the nozzle as the residues will cause blockage. 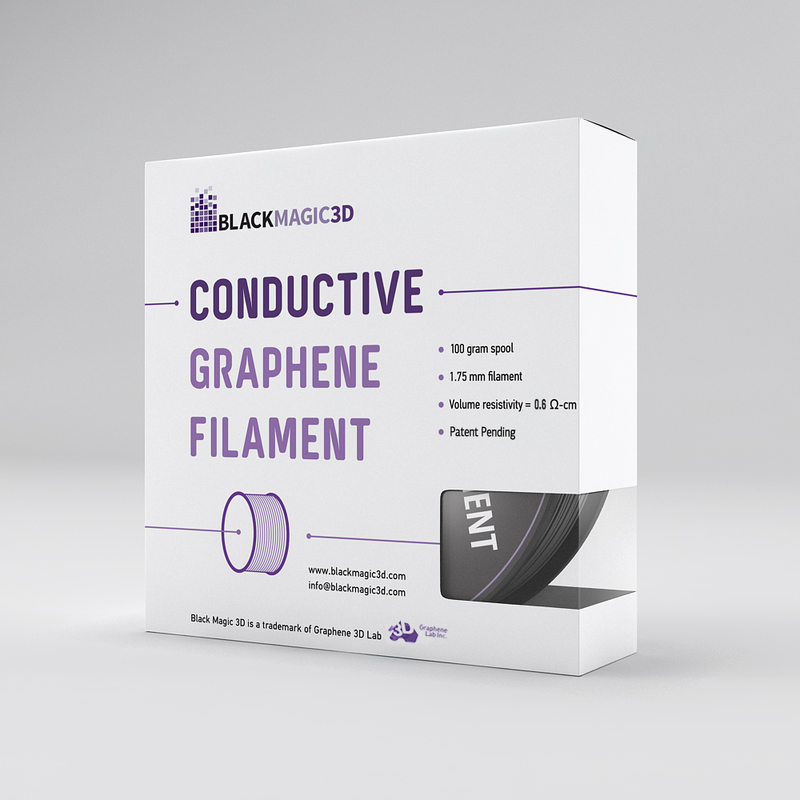 Our Conductive Graphene PLA Filament offers a volume resistivity of 0.6 ohm-cm. Volume resistivity is the measure of a material’s resistance to electricity within a cubic centimeter of material. In order to determine if the material will work for your project, you will have to keep in mind that the resistivity will change depending upon your print. It is suggested that our filament can be used for the applications below. Conductive Graphene PLA Filament may also be used for applications which require superior strength to ABS and PLA. Conductive Graphene PLA Filament can be used to create capacitive (touch) sensors used in a wide range of electronics which you interact with on a daily basis; it is an excellent material for designing human interface devices! Capacitive sensing can also be used to measure proximity, position, humidity, fluid levels, and acceleration. Another application of Conductive Graphene PLA Filament is in the creation of electrically conductive circuitry for use in electronics. We love that 3D printing is a push-button process and we aim to keep it that way. Traditionally, 3D printing enthusiasts needed to add circuitry to their creation after it was printed in plastic, using copper wire; by offering a conductive filament, you can print graphene wiring simultaneously with your build process! Note: The electrical resistance of a circuit must be considered in order to successfully use Conductive Graphene PLA Filament in electronics applications; specifically, the filament is designed for low-current applications. EMI/RF shielding is used to block the electromagnetic field and radio frequency electromagnetic radiation within a space; it is important to use EMI and RF shielding in a hospital, laboratory, or aerospace setting to protect against competing signals because they may lead to equipment giving false measurements. EMI/RF shielding accomplishes this by blocking AM, FM, TV, emergency services, and cellular signals. Conductive Graphene PLA Filament is ideal for designing EMI/RF shields used in highly-customized items. Because Conductive Graphene PLA Filament is mechanically stronger than ABS and PLA, it can be used to 3D print functional parts such as: hooks, hand-tools, and parts which require tooling, including drilling. Our filament is shipped in a vacuum-sealed package with a desiccant packet. Conductive Graphene PLA Filament should be stored in a dry environment away from dust and other particles. User should avoid extended exposure to moisture. We recommend storing in an enclosed container with a desiccant packet. 3D printers, especially their nozzles, should always be maintained, and should be cleaned before and after use of Conductive Graphene PLA Filament to avoid complications during printing. Users are also instructed to wash their hands before and after use of Conductive Graphene PLA Filament. Conductive Graphene PLA Filament softens at high-temperatures (~50°C) and is designed to be used with prints intended for room-temperature operation; it is intended for low-voltage and low-current projects only. Do not exceed 12 volts and avoid using the filament for power supply’s that exceed 100 mA. Resistivity of one meter of 1.75 mm filament is 4 kOhm’s. Keep in mind that a major factor influencing resistivity is contact resistivity, so shortening the length of the trace will not linearly correlate to a decrease in resistivity. The intrinsic properties of our Conductive Graphene PLA Filament is such that it should not be left idle (as in not extruding or printing) in a heated printer nozzle. It may expand and cause blockage. After the printing is complete, remove filament from the nozzle promptly. If using this material for dual-extrusion printing, we recommend using in conjunction with PLA. A 3D printer nozzle larger than 0.5 mm is suggested for use of Conductive Graphene PLA Filament. Interested in our conductive filament in pelletized form or other custom projects? Contact us today at support@blackmagic3d.com or by phone at (631) 284-9983. Our materials and products may be used by skilled, experienced users, and at their own risk. To the fullest extent permissible by all applicable laws, we hereby disclaim any and all responsibility, risk, liability, and damages arising out of any death or personal injury resulting from the assembly or use of our products and materials. Specifications are subject to change without notice.